From the “Correlation is not Causality” department we have this marvelous little graph. 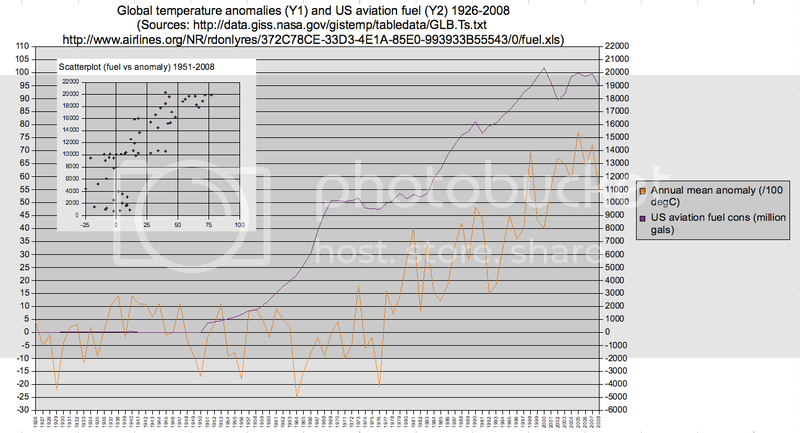 It shows the correlation between USA Jet-A fuel usage and the global temperature. Notice that unlike global CO2 levels, the Jet-A usage rises before the global average temperature. I’m sure you could try to spin this as jet fuel being a producer of CO2 and so a proxy for CO2 yada yada. I think all that jet exhaust from burning kilotons of kerosene right next to the airport thermometers is a more “proximal causality”… If you want to start assigning causalities, one typically looks at the closest and least diluted causality first. So what happens when your “Rural Reference Station” for Urban Heat Island effect is artificially heated with Kilotons of burning kerosene? Hmmmm? Think that might bias your “global warming” figure higher than reality? Given that the thermometers that are NOT at airports tend to be in towns (near all the cars burning all that oil) it makes sense to look at the fuel BURNING in proximity to the thermometers… And a lot of “fuel” gets consumed on the farm, too. A field of cows has a fairly large amount of oxidation going on. And, of course, that farm production ends up, eventually, finally, being oxidized as “poo”. Sewage Plant thermometers anyone? Yes, all those sewage plant thermometers found by www.surfacestations.org, where “poo” undergoes a final oxidation, do generate heat. Lots of it. The plant, which treats 4,500 liters of sewage per second, will use the ultra low-emission microturbines in a combined heat and power (CHP) application. In addition to producing 2.4 megawatts of electricity to power the plant’s equipment and buildings, the excess heat produced by the methane fueled microturbines will help maintain the proper temperature in the plant’s onsite digester used to breakdown sewage. When you are measuring PART of the heat in megawatts, you can “feel the heat”. This entry was posted in AGW Science and Background, Favorites, NCDC - GHCN Issues and tagged GIStemp, Global Warming. Bookmark the permalink. It strikes me that in the past a I saw piles of infra-red NASA satellite pictures — some with fairly good resolution. I googled and found a few, but not hi-res enough to be of much value. Still, NASA uses, as I understand it, night pictures of lights to assist in correcting temperatures. Surely IR pics are still made and might be more useful to measure/estimate UHI at various sites. 1. When (whomever) ‘added back in’ some of the deleted thermometers, I am now confused about the role of the ‘death of the thermometers’ in the purported global warming? 2. Which of your many fine dissections of the trends rely upon the deletions of particular thermometers (which were miraculously restored).? I think that you’ve got a good handle on an otherwise poorly explored aspect of the purported rise in GAT. But I can no longer tell what fraction of your omnibus effort is still germane after those faceless numerocrats were humiliated into doing their job to keep the record as broad as possible. I’d have trouble doing it, but is there any chance you can flag the now-moot segments of your legacy analysis, which address deleted-and-then-restored thermometers? i.e., is California still only represented by 4 thermometers? Also, for the thermometers that ‘died’ instead of merely being temporarily ignored, do the records end or are the records somehow arbitrarily ‘truncated’ despite continuing to be recorded? Are they ‘all the way dead’ or ‘only mostly dead’? REPLY: [ OK, not quite the perfect thread for this, but good enough. What was “put back in” was only in the USSA, not the Rest Of World. So nothing GISS did impacts anywhere outside of the USSA. (No, the extra S is not an accident. We are now the United Socialist States of America.) What was done was to add back in the USSA thermometers that were left out of GHCN but still in USHCN. Much to my chagrin, but only a little bit to my surprise, what was “added back in” was not what had been left out. What was left out had a different ‘modification history’ (i.e. less ‘modification’). What was “put back in” was the USHCN.v2 adjusted series which comes to the party “pre-cooked” by NOAA/NCDC. I’ve been stewing over what to do to highlight this act of treason (IMHO, of course). Not reached a conclusion, yet. 1. It was ‘added back in’ by GISS. It has no impact on The Great Dying of Thermometers in GHCN since, for example, Japan still uses GHCN. It only impacts GIStemp and then only for the USSA portion of the results. Further, since NCDC is clearly complicit in this, IMHO, conspiracy FACT (not theory, the CRU emails demonstrate the fact of collusion); all that was done was to move the “cooking” into the “adjustments” done to “USHCN.v2 adjusted”. So, unfortunately, because what was “put back in” was not what was taken out, the net effect was not what I first had expected. It is still “cooked books”, IMHO, just now the sausage comes pre-cooked for the USSA. 2. Only the USSA analysis is impacted by this, but even then I do not expect the results to change. All that has happened is that the “cooking” was moved one step up stream (and so I’m going to be “digging” even more at NOAA / NCDC and a bit less at GIStemp…). So, despite my early joy at seeing what I thought was them “doing the right thing”, in fact nothing of significance has changed. Devious bastards, aren’t they? 3. California is still only represented by 4 thermometers in any series produced only from GHCN (i.e. CRUT, NCDC, and the Japan Series) but is represented by more than that in GIStemp, though all of them have been hideously “adjusted” by NCDC prior to GIStemp (as compared to the prior USNCN set) such that no real change happens. I’m probably going to do an “exposé” on this after Christmas. For now I’m still “stewing” on it. Finally, the “dead” thermometer records. The short answer is “I don’t know”. The longer answer is: Most likely it is exactly like the USSA case. The local BOM has the records for many thermometers. They are still alive and recording. It is only NOAA / NCDC that has edited them out of the recent record. In some cases (such as, I suspect, Australia), the local BOM has “re-interpreted the past” into a new re-imagined series and it is just waiting to be “added back in” if the need arises… For some countries, such as China or Russia, I doubt that they are “on the team” and you will not see a “restoration”. For those that have been “pre-cooked”, you might well see such a play. In which case, comparison with the prior history to show the “cookage” will be enlightening. Just as it was for USHCN vs UCNCN.v2. A couple of minor points. First, airports had planes long before the jet age, however the planes burned aviation gasoline. 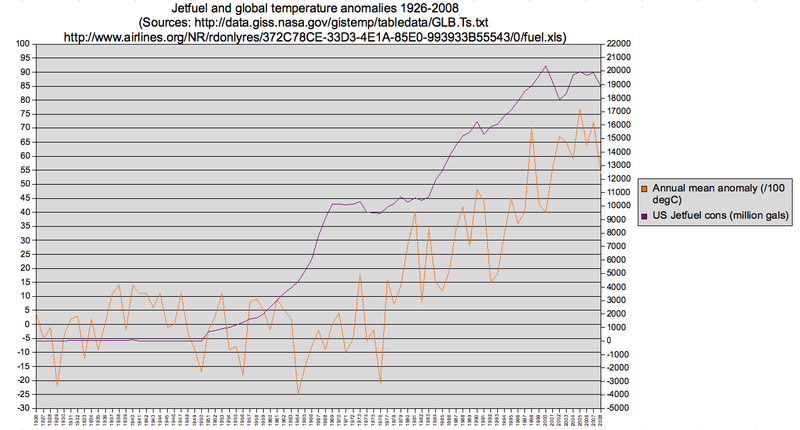 Thus, the first chart is somewhat misleading by showing zero fuel prior to 1964. Second, a type of jet fuel was produced in refineries and consumed prior to 1964, however it was called kerosene and burned for fuel, and some of it was burned at airports. Fog was dispersed at some (perhaps many) airports by burning kerosene or diesel fuel at intervals along the sides of runways, in a FIDO system (Fog Investigative and Dispersal Operation). You can’t make this stuff up! FIDO gave way to electric lights and electronic landing systems. Finally, it is very expensive to burn jet fuel while a plane is idling on the ground, so airlines try to minimize this. At very crowded airports, though, planes may taxi and idle for significant periods of time, half an hour or longer. I don’t think it is “misleading” so much as it is “incomplete”. It would be great to show the ‘total airport fuels’ (including ground equipment!) but you must start somewhere. And since the Jet-A volume is the largest thing at airports AND since the volume of fuel skyrocketed in The Jet Age, it is a reasonable “first proxy”. FWIW, Jet-A is only one class of the Kerosene cut that is “jet fuel”. I’ve used it loosely here. There is Jet-A, Jet-A1, Jet-B, TS-1, JP-4, JP-8 (similar to Diesel) and several other detailed fine distinctions. (For example, the Euro spec is a different designator than the USSA designator). I’ve not bothered to figure out exactly which of them is plotted in the graph (I suspect it is a composite of the various kerosenes sold in the USSA as jet turbine fuel). So please do not take the Jet-A statement as an engineering spec, it is only a shorthand for “jet turbine fuel”. 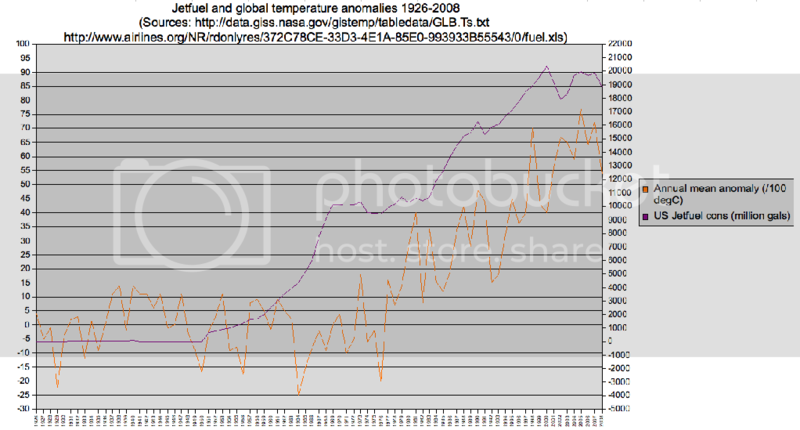 At some point are you going to be able to publish your own global temperature chart with open and well reasoned adjustments for UHI plus the various biases that you have spotted such as the “march south of the thermometers”. Or have you done it already and I missed it ? Always a good read, E.M. Smith. And it is amazing to me what I learn each time I click. I not only want to tip, I want to subscribe, but to this unlettered-in-computerese individual, your tipping place is unfriendly. I seem to have to fill out 3 fields — none of which applies to me as I read it — before I can contribute. Please help. I dont belive for a second that changed CO2 levels have any impact of the global temperature. However may high thin cloud have a strong heating effect. You might show the contrail induced heating. Thanks for your forbearance on my posting in not quite the right thread. I see now that I should have splattered my corn fusion over multiple threads. I’ll try to do a better job in the future. was a harbinger of a big pending re-analysis post by you. It is probably a good idea to wait until 2010 to address all of this with a flurry of omnibus posts, if you have the heart for it. E.M., yup, we made all those types of jet and kerosene and diesel products in the refineries I worked in for all those years. Lots of types, lots of specifications. The names are interesting, too, e.g. Arctic Diesel. They used a lot of that when building the Trans-Alaskan Pipe Line. Another thing I’ve wondered about, since you mentioned additional heat sources near weather/temperature measurement stations, is power plants. Typically these send 10 percent of the total heat produced into the sky via the smoke stack. More and more power plants built over the years means the sky gets heated a good bit. Another way of looking at the heat out the stack is to divide the power output by four. (Roughly, 40 percent of fuel goes to power for sales, 10 percent out the stack as heat, and 50 percent lost to cooling water at the condenser). In power generation is cooling towers common. Even for nuclear power plants. These move the not used energy to the atmosphere. 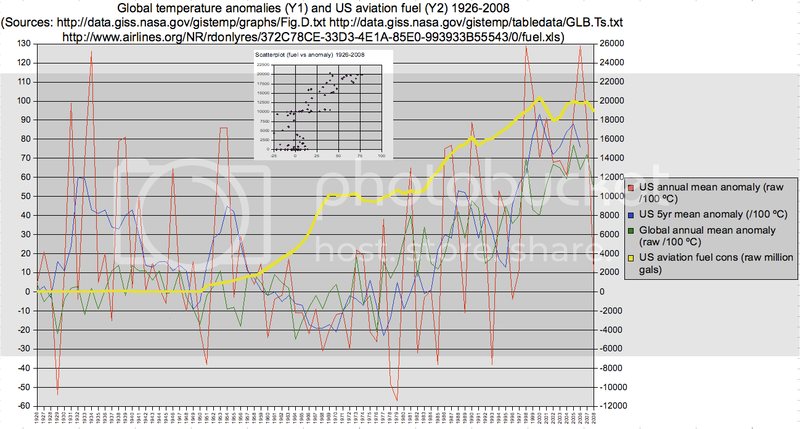 The raw data for jet fuel starts at 1926 – it is the reason the graph starts that year. There is a short zero part during WWII where there is no data. The numbers in the early 1900 are small which is why they appear missing. The spreadsheet (link on the graph) has the data for all to see. We do need thermometers at airports. It is critical for pilots to know airport temperature, because it affects maximum available thrust and therefore maximum takeoff weight. What we don’t need is for thermometers at airports to be used as the measure for global warming. Actually the full excel spreadsheet reports “fuel” used at US airports, so initially that would be avgas and later added jetfuel. The initial page with the link to the spreadsheet said “Jet Fuel”. In the paper by Nordell and Gervert (http://www.ltu.se/polopoly_fs/1.5035!nordell-gervet%20ijgw.pdf) the graphs of energy generated by global use of oil and total energy use on page 381 have a similar shape to the aviation fuel graph. So one could just as easily correlate any of those to the temperature record. If it is true that human civilization warms the earth, no politician will be able to turn the tide. Interesting to run the economics of reversing civilization’s energy consumption in a computer model. But why would anyone think that controlling 10% of internal earth heat sources (compared to geothermal), 0% of solar energy reaching earth, and 3% of earths CO2 sources (compared to natural) gives us a controlling interest? Check your voice mail and email and call me. You are invited to the city on Friday night. Check the papers on CRN. they give an estimate of the bias at airports. With all due respect, that paper may miss the forest for the trees. There is no mention of checking that the temperature sensors are sited according to the NOAA standards referred to at surfacestations.org. Also, the sensors being compared appear to be at relatively small airfields where the effects of large expanses of tarmac and heavy jet plane traffic would not be expected to be as great as at much larger airports. The expected temperature biases of improper siting and heavy jet traffic may be much larger (up to 5 degrees C or more) than the relatively small differences (0.1 to 0.3 degrees C) between the two sensors compared in this paper. The Sun paper is undated but data studied was collected 2002-3. There is no mention of airplane traffic as a factor needing correction. This paper compared airport heat index (http://en.wikipedia.org/wiki/Heat_index) to playing field temperature, which could give an indication of the airport heat island. Unfortunately, the raw temperature data was not published. Interestingly the formula for converting heat index (HI) to playing field measured wet bulb globe temperature (WGBT) gives an indication of the temperature relativity, excepting that heat index is humidity dependent – higher humidity raises heat index. WGBT and temperature are about equivalent at 50% humidity. IE: At about 76 degF, the airport and playing fields were equivalent. Above 76degF, playing fields were cooler than airports by up to 10deg. Assuming equivalent humidity at airport and playing field, this indicates the airport heat island. If playing fields are more humid than airports (expected), then the temperature difference will be larger. Now either this is a large temperature differential because of tarmac or airplane traffic. Is there a repository of citizen collected city temperature data in comparison to airport data???? World Meterological Organisation initiative to create reference climate stations (RCS) still has lots at airports. Otherwide UK Hadley has all the long-term data for WMO. Fabulous! Is there some good information somewhere about airport heat islands??? Can we unsmooth that jet fuel chart? I don’t know how the updated paper differs from the Sun and Baker version. Over the 49-year period, the population of Fairbanks grew by more than 500%, while the population of Eielson remained relatively constant. The mean annual heat island observed at the Fairbanks International Airport grew by 0.4°C, with the winter months experiencing a more significant increase of 1.0°C. The jet fuel chart has not been smoothed. It is raw data, as is the temperature. It does use annual consumption compared to annual temperature anomaly. There is monthly fuel data in the spreadsheet from 1986 on if anyone is inclined to analayse it. One of the interesting siting issues that Anthony Watts has uncovered at surfacestations.org is the fact that many of the stations are located at sewage treament plants. He surmises that this is because they are operated 24/7 so someone is there to take readings. Nothing like taking readings next to a large complex stewing organic waste. not only does the environment invalidate the AGW theory but that it also fails the 3 main scientific tests – tarski’s theorem, the classical model of science and scientific method. It is noteworthy that one of the principles of the scientific method is skepticism and this is what many climate realists have been attacked for having by climate alarmists. Therefore the theory of AGW must by reason be abandoned. Thought you might like the photo from a UK met office fact sheet. Not exactly sure were at Heathrow this is, google map does show a little white dot midway between business parking for terminal 1 & 2 and the main runway. Wherever it is, It must be very firmly anchored to the ground ! Stumbled on the US GIS temp data from NASA, so added them to the graph. The difference is astonishing. There is huge variability in the US data compared to global. Why would that be???? The screen at Heathrow is actually towards the perimeter fence so is very close to a vast acreage of runways and also a very major road with numerous factory units along it. It would be intersting if EM Smith had any knowledge of when and by how much the UHI factor was applied. Prior to around 1955 this was a fairly rural area. On this site, there are serial maps of urban heat islands. The ones with large airports where is was clear where the airport is – eg Osaka, Singapore, there is a clear airport heat island effect visible of similar magnitude to the CBD. I have had a brief look so far. Urban heat islands are hotter by anything from 0 to 14K. I note they quote tables of data where airports are used as a “rural” reference too. A lot of the studies are on old data pre 1970, when aviation wasn’t what it is today. The magnitude of urban heat island seems to vary enormously for different cities. Seeing the satellite data, at least large airports have a similar magnitude of heat island, consistent with the on the ground study by Coyle suggesting 5-10degF airport heat island at Tulsa. It seems likely that some airports will be as hot as CBD and others may be as cool as rural, depending on heat load, wind, etc. Still looking to find a study on this. Why do you lock yourself into the idea that the only effect of Jet fuel is to distort temperature readings at airports? As stated in a prior post, most airports are not large airports with takeoffs and landings per minute. Additionally, I see nothing to factor in the idea that the vast majority of jet fuel is being burned while at great distances from airports. So taking the number of aircraft in the air at any given moment, the graph could just as well support the opposite of your desired outcome. REPLY[ I’m not “locked in” to anything. There is a known increase in temperatures at airports, strongest when winds are low. Aircraft fuel use, especially at takeoff, have increased dramatically over the years. (Compare a DC3 takeoff fuel burn vs a Boing 747 … ) and airports grow over time. Look at the increase in acreage of tarmac at SFO, for example, where it has gone from ‘grass field’ in the early years to a couple of miles of pavement with non-stop cars, busses, and ‘ground equipment’ today. Airports grow. The stations I’ve inspected are most frequently large international scale commercial airports (such as all of them in Hawaii and the ones in California). And the none to subtile impact of hauling a few thousand tons of ice and snow off of airports in winter. A field under 4 feet of snow will NOT warm up as fast on the ‘first sunny day’ as a few square km of tarmac in the sun.